A hot tub is always fun and games when you first buy it. But there comes a point in time where that hot tub needs to be replaced or removed. Then, you have to figure out how to remove a hot tub from wherever it's been placed. South Bend Junk Removal does just that. We know how to remove them and dispose of them in a timely manner. We will make sure that the hot tub is removed from your backyard, from your home, from your garage or wherever it needs to be removed from. We can handle it. We service the South Bend Indiana area and offer competitive rates and friendly service. We can even remove them from indoor areas without damaging your home, office, or gym. 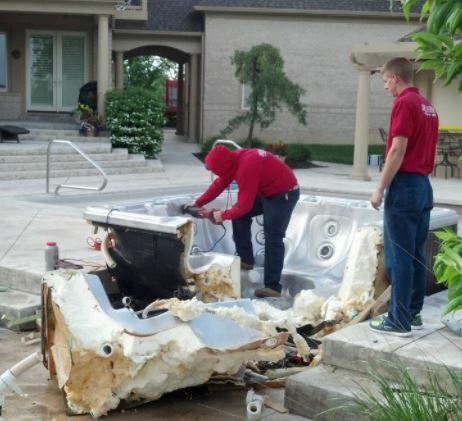 Our experts know exactly how to help you with your hot tub removal needs. Hot tub removal can be extremely difficult. They are big cumbersome and heavy. Have you been trying to sell one and it just hasn't worked out? Perhaps you bought a new one? Give us a call today and let us come out and free up your space.Leaving an old hot tub in your yard can be an eyesore. Children playing around old hot tubs can get hurt and that makes them extremely dangerous. Give us a call today and let us figure out how to help you. Our staff makes the process easy and cost-effective. We can help you decide exactly what you need and how you want to go about the project. Our site is easy to use, and has been designed to get you in touch with somebody as quickly as possible. That way we can get to you and help you with all of your junk hauling needs. South Bend Indiana let us show you why we are the king of junk. Our company handles anything from garbage collection services and waste management to electronics and Furniture recycling. No matter what your needs are we have a solution for you. When the fun of your hot tub is over and it's time to let it go give us a call. Keep the fun memories and don't be weighted down with the difficulty of getting rid of the hot tub when it's time for it to go. We can dispose of the hot tub in the appropriate manner the following all local laws and make it easy on you.Equipment and labor can be expensive. if you don't already have the equipment renting it can be a pain and expensive.